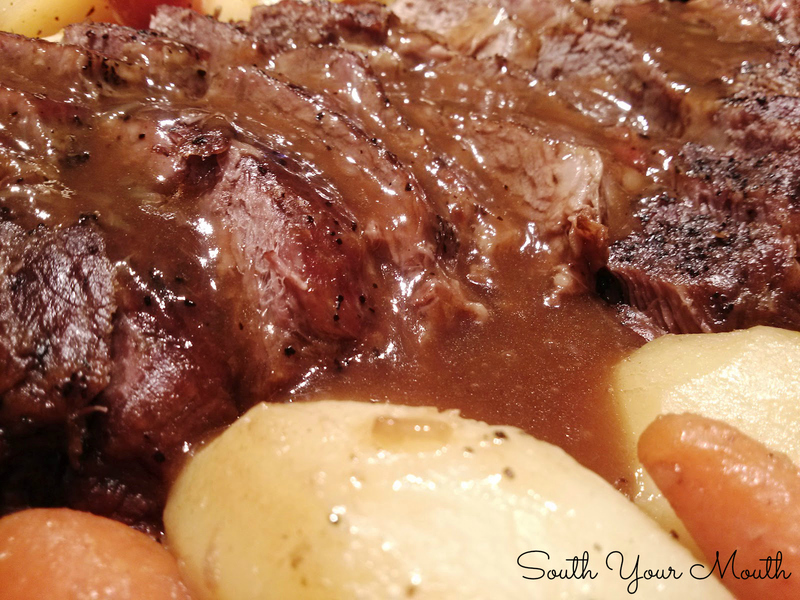 Fork-tender chuck roast recipe with potatoes and carrots slow-roasted with beefy gravy made with Lipton onion soup mix. I've cooked roasts six ways from Sunday but my all-time favorite is the way my mama cooks it... with Lipton Beefy Onion Soup Mix. You just can't beat it. It's easy and ALWAYS turns out perfect. If your goal is a fork-tender roast that falls apart if you look at it hard, always go with a chuck roast. The marbling and cut is what yields the super tender results. Season roast on both sides with salt and pepper. Heat olive oil in a large skillet on high heat. Sear each side of roast (and sides if thick enough) in hot skillet about 2 minutes or until nicely browned on each side. Place roast in a large roasting pan. Combine both soup mixes with water and stir well. Pour soup mixture in roasting pan (not on top of the meat). Cover with a tight-fitting lid or tightly with aluminum foil. Bake at 300 degrees for 2 hours. Note: If you're roasting in the same pan you seared the meat, remove the roast and set it aside before you add the liquid. If you put the liquid in a hot pan it could start to boil which will "seize" the roast and make it tough. For more on that and some of my other tips, click here. Remove pan from oven and ladle out 1 cup of broth; set aside. Add potatoes, carrots and onions to pan surrounding the roast. Cover pan tightly again and continue baking for 1 hour. Remove pan from oven. Move roast and vegetables to a serving platter and cover to keep warm. To make gravy, place roasting pan on the stove (to cover 2 burners if using an elongated pan) and heat on medium-high heat. Add cornstarch to a small bowl and whisk in reserved 1 cup of broth. Whisk cornstarch mixture into pan juices and heat until simmering. Simmer for 3-4 minutes, whisking continually, until thickened. I hope everything turned out all right! Thanks for commenting! It was DELICIOUS! Everyone ate it. This recipe is so easy and so flipping good! I'm Going To Try This Tonight, But I'm Using A Roasting Oven Instead Of Conventional. Can't Wait To See How It Turns Out. I made this tonight. I used a chuck roast and cooked it in the oven. I did substitute beef broth for the water. It was absolutely delicious. It has officially become one of my favorite pot roasts. Thanks so much for sharing this recipe. I love this recipe!!! I also put a can of cream of mushroom soup in it.We have cool weather coming our way again, so it roast dinner for Sunday. Hi, I'm going to make a pot roast in the oven tomorrow. I have always made it in the slow cooker, but I thought I would try it this way. I'm going to use the onion soup mix. I would like to put a small can of cream of chicken soup. Would I just mix that in with the onion soup mix? Can I cook this in the oven in my cast iron skillet? Sure! As long as you can cover it tightly! I am making this for the second time right now. It is one of my favorite recipes and perfect for having company over! the gravy was the best gravy i have ever had. thanks so much for sharing!! Is the roast supposed to be in the juices or on a rack above the juices? No rack. Everything cooks in the pan together. I plan on making this soon , with one change and that will be flour for the gravy ..not cornstarch. It sounds like its gonna be a hit . Thanks. There are a lot of factors that keep it from drying out: the marbling in the chuck roast, searing it to seal in the juices, cooking at a low temperature and cooking with a tight-fitting lid or foil. I hope yours turned out good! I put the roast in with out browning, add the lipton onion soup mix and half cup of water, close the lid and leave it 6 hours, if frozen cook 8 hours on medium in your crock pot. Just put it in the oven! Used chopped onion & homemade beef stock, as I didn't have soup mix which I usually do! This should be good, just didn't want to use crock pot this time! I made this and it was delicious!! All of my kids loved it, not one complaint! Thanks for sharing. Instead of Beef Broth try Campbell's Beef Consomme. The flavor is a little more intense than beef broth. There is no mention of beef broth in this recipe. Chuck Roast is one of our favorite meals. 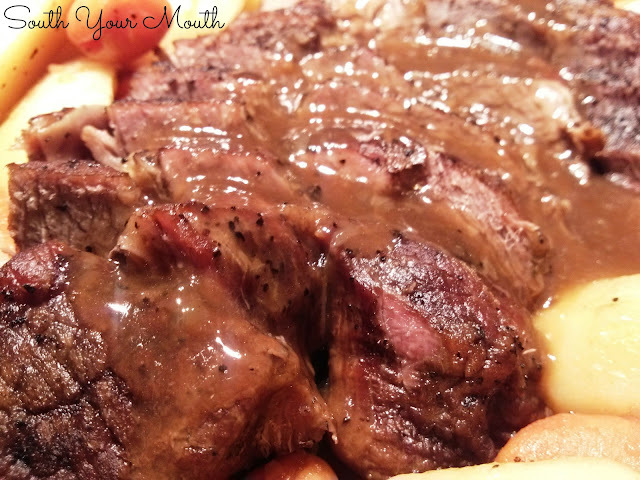 I just used this recipe for my hubby's Birthday Dinner and it was THE BEST. Tasted as good as Bob Evan's pot roast dinner. Thanks for sharing! Made this today and it was delicious. I started with a frozen blade roast and it was to most tender beef I have ever eaten. I cooked it a little longer. The gravy was one of the best parts. Will definitely make it again. Very good recipe! Will definitely make it again! I'd just bought the beefy onion soup and was looking foe an oven recipe I like roasting more than crock potting. I love thus, it's 4:00 on a lovely South Florida Sunday and she's a roasting. The only thing my grandmothers and Mamma did differently was to roast the beef uncovered for 12-15 minutes on 400 to get it going. I grew up in Detroit with wonderful friends and family but my roots are in Alabama, Mississippi, Georgia and Florida. I love our old recipes and I can't wait to taste Your Mom's!!!!! I came across your version on pot roast and trying it tomorrow night , using parsnips in place of potatoes since me and my wife are on a low carb diet ! it sounds great .can't wait to try it !! My roast is in the oven as I type. I hope it tastes as good as it smells. Im making this right now! I was wondering since I think im out of corn starch can I use flour for the gravy? Ive never made homemade gravy before. And do u put the potatoes/carrots and onions in at the same time as the meat or wait for an hour or so? I really want to make my man the best pot roast we just had our first snow fall of the winter and this is a dinner that screams cozy, warm winter to me! The potatoes and carrots go in the last hour of baking ;) I think you could use flour, though I've never done so myself in this way. I would use 1/4 cup and see how it goes. Good luck! YOU GOT THIS!